The Windhawk 35 is the latest product from the board of Blenheim designer Tim Barnett, and if, at first glance, you think it seems vaguely familiar, you’d be correct. The launch is a subtle rework of one of Barnett’s earlier creations – the popular Tortuga 35 – designed in the early 1990s. 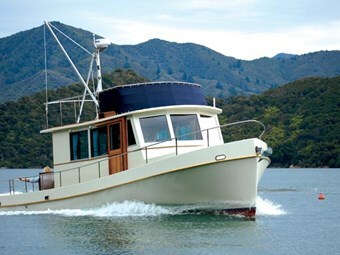 The Tortuga sports a distinctive cabin structure, a low, sweeping sheer line and a broad, comfortable beam. Seven were built and the design developed a reputation for its easy action. While retaining all those attributes, the Windhawk 35 has a remodeled interior layout (providing more space and accommodation) and is more geared to low-maintenance boating. The Tortuga featured plenty of exterior teak paneling and timber sash windows. On the Windhawk that’s been replaced by fibreglass and aluminium window joinery respectively. The result is crisper styling without detracting from the classical feel. cove without feeling like an intruder. Boarding the Windhawk is a simple matter of stepping over a low, aft gunwale – either from the jetty or the swim platform – into a very spacious cockpit. There is plenty of room here for all sorts of activities – fishing, diving, alfresco dining or even a romantic, moonlight shuffle to Alker Bilk’s soaring clarinet. For some reason – and I suspect it’s because the very low cockpit sole puts you closer to the water level – you feel more pleasantly ‘attuned’ to the environment. access to a huge storage hold. Brass and bronze cockpit fittings underscore the classical styling. primarily for storing a three metre inflatable. A locker under the flybridge stairs includes storage of outboard fuel and gas bottles, and a small hand basin with a H/C mixer. Up on the flybridge, a purpose-designed aluminium tower and davit (fitted with a self-tailing Lewmar winch) launches and retrieves the inflatable. The tower’s also the mounting point for the Simrad radar’s dome unit and VHF aerial. With the inflatable launched, the flybridge converts into a spacious sun-bathing platform. Access to the foredeck (from the cockpit) is along fairly narrow sidedecks. Their width is a trade-off (the upside is a very roomy saloon), and you have to crab along sideways. But a robust, stainless steel handrail provides plenty of physical and psychological support. n keeping with the traditional styling, the foredeck sits within a flared bow and high gunwales, suggesting a seaworthy boat that stays dry. The business end of the foredeck boasts a Lewmar electric windlass and 35lb Delta anchor with 75m of 8mm chain. It’s controlled by a foot-operated pedal, with a chrome bollard. cabin structure translates good headroom (at least 6’6") in the saloon. With the generous beam, it creates a spacious saloon and, as if to underscore the point, the L-shaped settee is complemented by two armchairs. Add the bookshelf, brass barometer, thick carpeting and large teak table – it’s a very homely area. Large, sliding glass windows (tinted) along either side of the saloon, and three large panes in front bring in masses of light. It reflects off the maple cabinetry that’s used throughout the boat. The saloon’s use of white canvas upholstery (with navy and gold piping), white curtains and white paneling add to the clean, crisp ambience. A simple, elegant presentation. But my favourite saloon feature is the faint but exotic smell of Danish oil on the timber. Barnett has positioned the galley forward of the saloon area (on the port side) – a design that contributes to the spaciousness of the saloon. Compact but perfectly serviceable, the galley features a three-plate gas cooker, a fixed oven, a thwartships-mounted sink with H/C mixer and a wide array of maple drawers and cupboards. Brass push-button latches contrast nicely with the maple joinery. Directly opposite the galley (on starboard) is a cabinet housing a 12v front-loading, Isotherm 130-litre fridge. The galley is also equipped with a number of 240volt AC outlets for when the boat is hooked up to shore power. 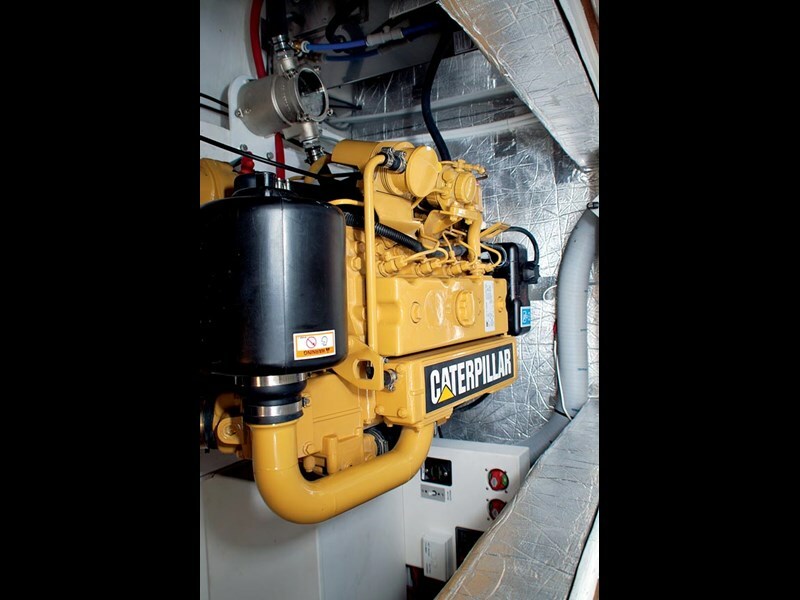 A large hatch in the saloon floor provides access to the 90 hp Caterpillar with ample room to service the engine and all of the ship’s systems. For’d, to starboard, is the helmstation. Its console carries the Caterpillar’s instrumentation as well as a Ritchie compass, Simrad colour chartplotter and Lewmar bowthruster controls. A full-length, sliding door at the helm station makes it easy to poke your head around and communicate with someone on the foredeck – great for negotiating into a tight berth and anchoring. Three steps down takes you into the forward, main cabin with its slightly offset V-berth. Effectively, it’s a double bunk to starboard, with a single bench to port. Iroko paneling on the inside of the flared bow contrasts effectively with the maple joinery and the pale carpeting on the bulkheads, ceilings and floors. The main cabin is fitted with three bronze (opening) portholes. under the mattresses, and more in the hanging wardrobe with its roll-up louvre door. The main cabin’s en suite is to starboard. Clean, simple and spacious, it carries a pull out shower from the handbasin (with a hot/cold mixer) and an electric toilet. Windhawk’s second cabin is midships under the galley/saloon floor – and entry is by descending a simple ladder. This cabin represents the major departure from the original Tortuga design which featured only a double cabin and a double-bed/saloon settee. The new design offers sleeping for four – two fore-and-aft single bunks and one double, thwartships bunk between them. There’s not much headroom, but it’s spacious and comfortable. Ideal for an adult couple or a den for the kids. A full-length keel (containing nearly a ton of concrete) and the 3.85m beam make the Windhawk a very stable platform. It’s an easy running displacement hull, and with the 90 hp Caterpillar (driving a 29" diameter, four-blade prop) turning over at 1800 rpm, we cruised at nine knots. The hull has been contra-faired (forward of the aperture) to maximize the prop’s efficiency. 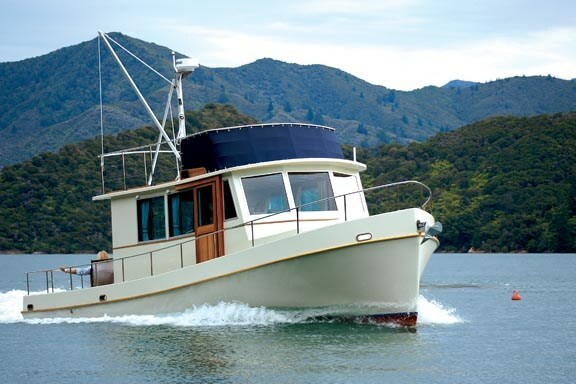 Hydraulic steering (Seastar) is very light (and the boat remains relatively level in even tight turns), and the bow thruster helps with maneuvering into tight berths. As indicated, a major feature of the boat is quietness – the result of good engine room insulation and the exhaust tucked under the swim platform. For me, the boat is an obvious candidate for chartering. She’s responsive, easy to use and uncomplicated. She’s also equipped with heating (a diesel-fuelled heater) and, with insulated sides, remains warm and snug. 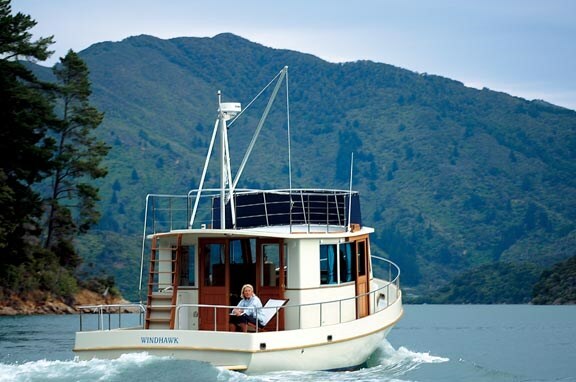 That should encourage a longer boating season – even in the Marlborough Sounds. Barnett calls the Windhawk ‘a small ship for all seasons’ – and it’s difficult to disagree. She’s a gem. ?